To help you get into the decorating spirit, PersonalCreations.com has pulled together this great list of free Christmas printables from some of their favorite bloggers. Check out all these creative ways to add your personal touch to all of your holiday celebrations. • Cute labels to spruce up your Christmas cookie gifts. • Need a quick, last minute gift? Fold up a few of these gift boxes or cash holders. • Holiday bunting and paper craft trees help you decorate inexpensively. 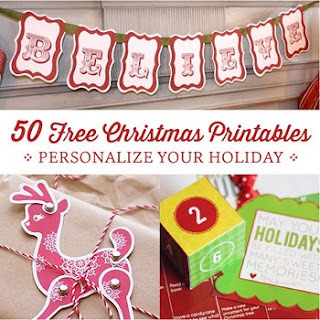 In all, there are 50 different ways for you to get crafty with fun printables this holiday.